NASA's Dawn spacecraft recently made its closest flyby of Ceres, sending back the most detailed views of its surface. Ceres is the largest object in the Main Asteroid Belt located between the orbits of Mars and Jupiter, and the only dwarf planet closer to the sun than Pluto. While news from that other dwarf planet encounter of 2015—New Horizons' epic and brief July flyby of Pluto—has dominated attention in recent months, Dawn has been quietly and persistently scouring Ceres for information. On December 10, Dawn captured images of Ceres' southern hemisphere from an altitude of only 240 miles, its closest encounter to date. From this close orbit, image resolution of Ceres' surface is about 120 feet per pixel, which is providing scientists with unprecedented details of the tiny fractured and cratered world. Speaking of fractures and craters, Dawn has revealed a collection of "trough" features, found all over the dwarf planet's surface. While many of these cracks appear to be associated with impact craters and formed by shattering collisions with meteorites, some appear to be tectonic in nature. Tectonic stress fractures have been seen on other solar system bodies, including Earth and Mars. These are cracks formed by the contraction of a planet's surface or by the weight of mountains that build up, whether by volcanic eruption or tectonic uplift. Olympus Mons, Mars' mega-volcano, is an example of this. Though Ceres is very small—only about 584 miles across, on average—the evidence of internal forces and processes that have broken its crust is tantalizing. A number of small bodies in the solar system have surprised us recently by showing signs of internal activity—Ceres, Pluto, and Saturn's moon Enceladus, to name three. Dawn's other instruments have made observations of Ceres' chemical makeup that are also intriguing. Earlier in December, the composition of the mysterious "bright spots" was revealed as salt, possibly a type of magnesium sulfate called hexahydrate. 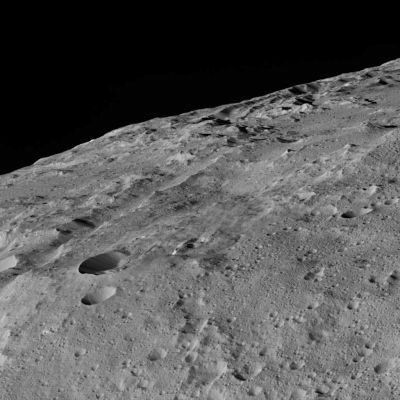 Ceres has also been found to contain ammoniated clays, which suggests that the material it formed from may have originated in the outer solar system where ammonia is abundant. 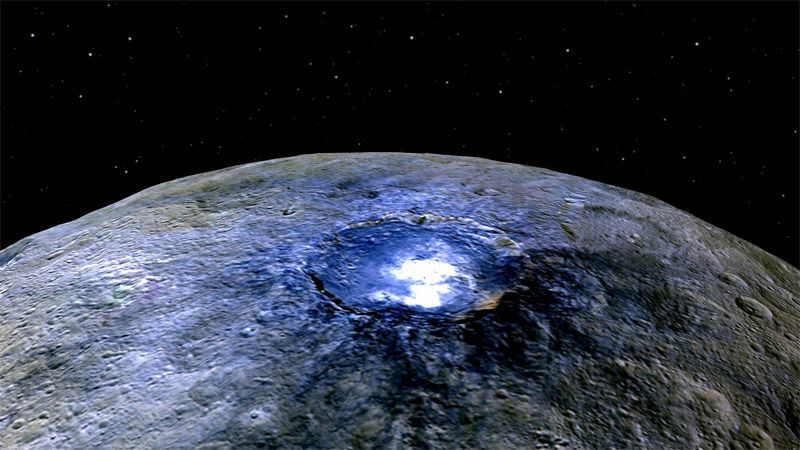 Whether Ceres formed in the outer solar system and then migrated to its present location in the Main Asteroid Belt, or the materials it coalesced from originated out there, is not known, but either way the finding offers fascinating insights into the solar system's past. There are five objects in our solar system classified as dwarf planets (with potentially many more to be added). Four of them—Pluto, Eris, Haumea, and Makemake—are Kuiper Belt Objects, orbiting the sun in a vast belt of icy material extending from beyond the orbit of Neptune. Among the dwarf planets, Ceres alone resides relatively close to Earth. The rewards of data mined from Pluto and Ceres by New Horizons and Dawn gives us the opportunity to compare these two very different objects, and helps to define the range of variation in properties and surface conditions of dwarf planets. Before arriving at Ceres, Dawn spent a year orbiting the asteroid and protoplanet Vesta, making it the only spacecraft outside of the Earth-Moon system to orbit two different objects. One of the things that enabled Dawn to do this is its cutting-edge electrical ion propulsion system, a highly efficient engine that uses low power, but constant thrust to achieve greater velocity changes than conventional chemical rocket engines. So what's in the future for this versatile itinerant robot? 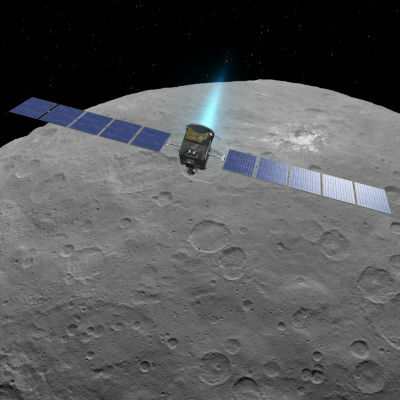 As it turns out, Dawn will remain in orbit as a permanent artificial satellite of Ceres even beyond the duration of its mission, currently schedule to end in June. So, we still have a few months of cool pictures and potentially awesome discoveries to look forward to. After that, we can shift our anticipation back to New Horizons and its 2019 encounter with Kuiper Belt Object 2014 MU69.